This power plan was installed within the bounds and using the facilities of a bigger PV plant of 700kW based on conventional flat plate modules, with a fixed tilted mount. 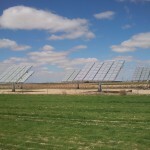 Located in the town of La Villa de Don Fadrique in Castilla-La Mancha (Spain), the whole plant is operated by Spanish PV developer Generaciones Fotovoltaicas de La Mancha. It is grid connected, selling its production to the Spanish wholesale electricity market. As a matter of fact it is among the first PV plants that got to directly sell its electricity, without any specific feed-in-tariff. Its construction was completed on 20/04/12. In its opening ceremony it was officially inaugurated by the major of Villa de Don Fadrique, and counted with representatives of the Technical University of Madrid (Instituto de Energía Solar – Universidad Politécnica de Madrid), the French National Institute for Solar Energy (INES), University of Tokyo, and Daido Steel. The NGCPV project aims, with a long-term view, to develop concentrator photovoltaic cells with a cell conversion efficiency of more than 45%, NGCPV aimed at cell conversion efficiencies over 45% , through strategic coordination and bringing together the technologies and expertise of Japan and Europe. Specifically, in addition to the development and assessment of solar cells and modules, new materials and new solar cell structures were be developed, and approaches to standardize measurement technology for concentrator photovoltaic cells were explored. The project was jointly conducted by industrial, academic and governmental research organizations from Japan and from six member states of the EU. The Japanese research team, led by Professor Masafumi Yamaguchi of the Toyota Technological Institute, included Sharp Corporation, Daido Steel Co., Ltd., The University of Tokyo, and the National Institute of Advanced Industrial Science and Technology. First EU-Japan R&D project jointly funded by European Commission 7th Framework Programme and Japan’s NEDO The EU research group, led by Professor Antonio Luque of the Technical University of Madrid, consisted of Fraunhofer Institute for Solar Energy Systems (Germany), Imperial College London (United Kingdom), Italian National Agency for New Technologies, Energy and Sustainable Economic Development , BSQ Solar, PSE (Germany) and the French National Institute for Solar Energy.